This book looks at serious questions regarding your practice no one ever taught you. 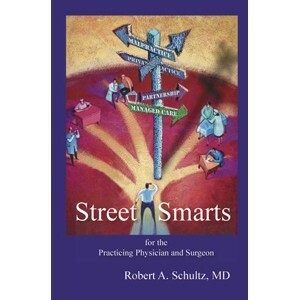 Dr. Schultz explores and helps answer these important questions and adds a bit of humor to the process. Is Workman's Compensation business worth it? Is bedside manner more important than skill? Is managed care here to stay? Is the dirty "M" word malpractice or money? What is the best for you: solo or partnership? Are there any winners in divorce? Is it ok for doctors to advertise? Robert A. Schultz, MD earned an A.B. degree at Hamilton College in 1969 and his medical degree from Cornell University Medical College in 1978. Between these periods of academic enrichment, he traveled the world exploring European, African, and Asian cultures. Dr. Schultz underwent two years of general surgery residency at The New York Hospital (Cornell), after which he completed his orthopaedic residency at the Harvard Combined Orthopaedic Program and was a clinical fellow in orthopaedic surgery at Harvard Medical School. After more than 20 years of private practice in New Jersey, Dr. Schultz retired. Presently, he serves as a clinical associate in the Department of Orthopaedic Surgery at Duke University Medical Center. 3. What Are You Thinking: Solo or Partnership? 4. What Kind of Partnership Is Right for You? 9. Is Managed Care Here to Stay? 12. Which States Are Doctor Friendly? 14. What Type of Specialty Mix Should Your Practice Have? 20. My Mortality? Who Has Time to Think About That?